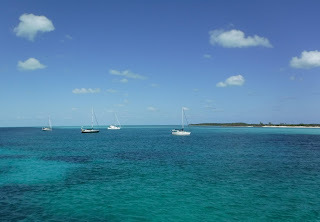 We are anchored off Wax Cay in the Exumas (map), just south of Norman's Cay. 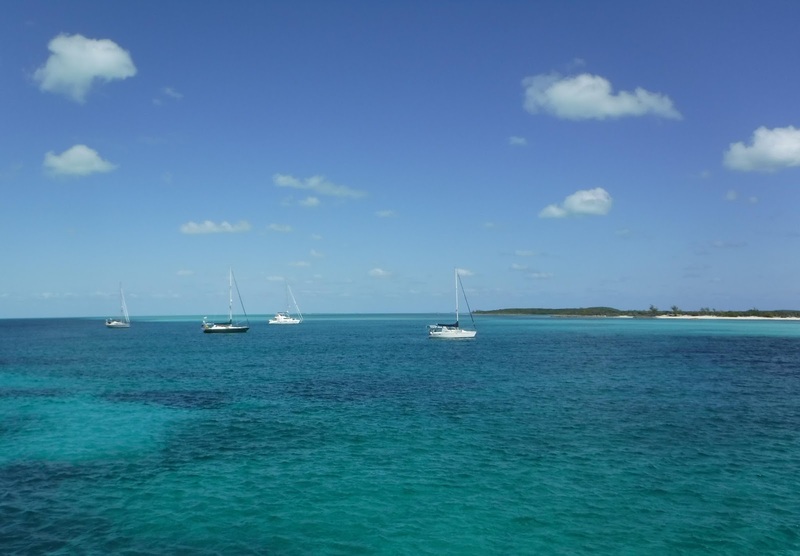 There are some nicer anchorages a little further south, and we had plenty of time, but they are within the boundaries of the Exuma Cays Land and Sea Park, which since March 1st has been assessing a $0.50 per foot per night charge to anchor. We're not inclined to pay $26, plus have to drop the tender to run over to the drop box, just to anchor for the night in-transit. 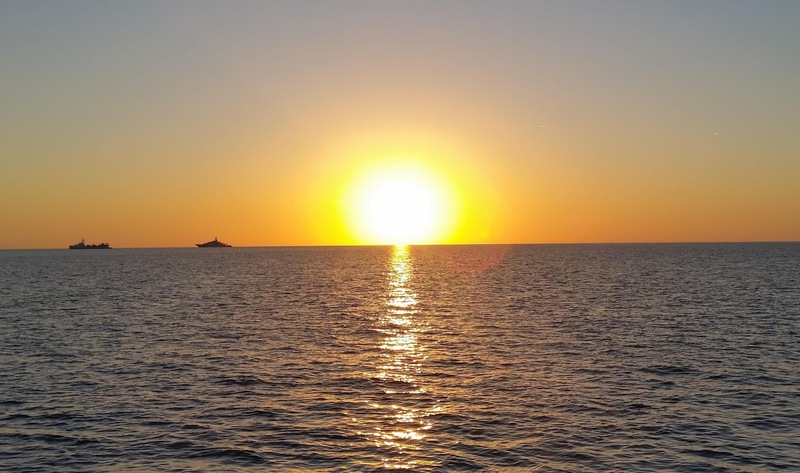 Sunset from our anchorage off Wax Cay. Intrepid and Infinity are silhouetted at left. Yesterday afternoon the swell continued to build as we continued to Nassau. By the time we were on the approach, we were in a six foot quartering swell. By itself that would not have been a problem, but we also arrived at the harbor approach just after 5pm, which is when Norwegian Sky dropped lines to depart. When we called Nassau Harbor Control for clearance to enter, they asked us to hold outside until Norwegian Sky departed. Unfortunately, that meant we had to circle, just like an airplane waiting for landing clearance. And what was a six-foot swell out in thousands of feet of water was a series of short-period, steep rollers approaching the beach, and circling meant unavoidably crossing them exactly beam-on. We took quite a roll on the shoreward side of our big circle. As soon as Norwegian Sky crossed the outer markers I called Harbor Control back and they cleared us to enter, so long as we could cross quickly ahead of Disney Dream departing at 5:30. As we made the outer markers the pilot on the Dream asked us to increase speed and I had to inform him we were already at Full Speed. We maintained 80% throttle all the way to the cruise docks and Disney pulled out just after we passed. Nassau Harbor looking west from our anchorage. 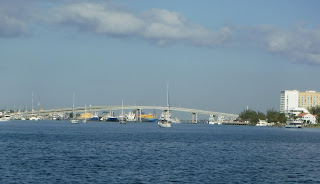 Cruise ships visible under bridge to left. Mail boats center frame. Paradise Island is to the right. It was otherwise a casual ride to the other end of the harbor, where we dropped the hook behind the Nordhavn 86 Vega (map). We had been at Lauderdale Marine center with Vega for a couple of weeks; they were having in-water refit work done. Vega was neither the first nor the last yacht we will see here that had been at LMC with us, and this morning we were passed by the Dolphin Encounter tour boat, which also had been there with us getting warranty engine work done. We were amused to see them load the whole boat full of cheap soft drinks and snacks before they left, likely a quarter the cost of those supplies in Nassau. With the delay entering the harbor and a bit of hunting for a spot to anchor, it was nearly 7 by the time we had the tender in the water to go ashore. I never did get a top-up for the phone, but we enjoyed burgers at the bar at the Green Parrot. We sat with Judi and Richard whom we enjoyed meeting; they had wandered down from their hotel to listen to the band, which was decent and played many of our favorites. We got more music than we bargained for, however, as an enormous party boat with very loud live music circled the harbor long after we arrived back home. We were anchored abreast of Fort Montagu. This morning the harbor was abuzz with activity. As we sipped our coffee on the aft deck, dozens of boats carrying tourists from the cruise ships passed us. Some were fast boats headed off to various islands for beach days, some were snorkel or diver tours, one was a high-speed powerboat ride, there was a two-masted schooner, and even a "submarine" tour that involved a boat which never fully submerged but had seating and underwater windows to observe the fish. And, of course, the aforementioned Dolphin Encounter. Not long after this steady outflow of tour boats departed, the exodus of cruisers began. With perfect conditions on the bank today, a dozen or so boats of all descriptions left the harbor ahead of us, from 30-something sailboats to 90' charter yachts. We weighed anchor and followed behind a couple of familiar names, who quickly left us in the dust. 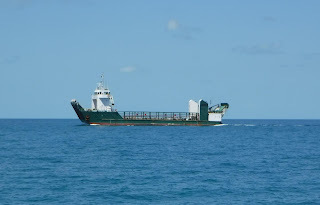 We crossed paths with the Champion III, a landing-craft type cargo vessel typical of many plying Bahamian waters. We were the stand-on vessel and he diverted course for us. 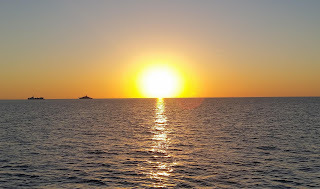 We had a very pleasant cruise after leaving the harbor. I only had to relieve Otto for about fifteen minutes right in the middle, as we transited the coral-head minefield that is the Yellow Bank. 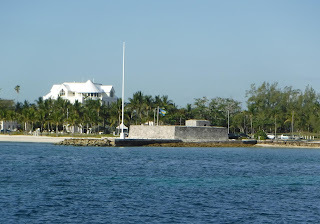 It was so calm when we arrived here that we had no need to wend our way into any of the various protected spots among the cays. 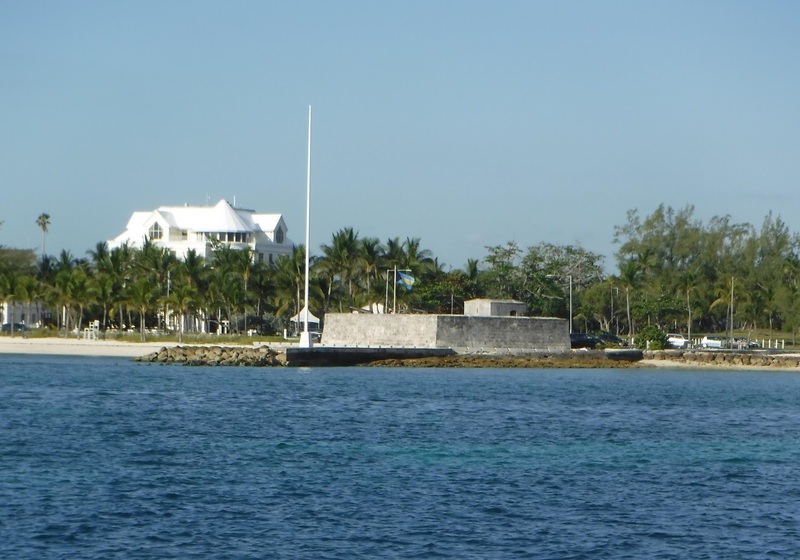 From here we can see boats anchored down by Shroud Cay in the park, and along Norman Cay to the north. 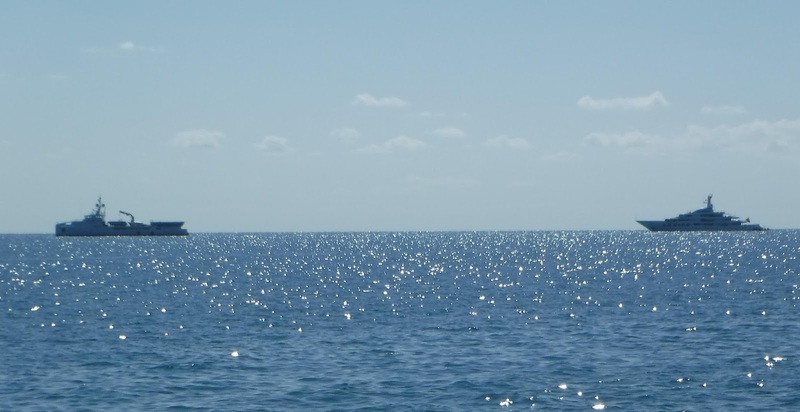 But the two closest boats to us would be Infinity and her shadow vessel, Intrepid. Intrepid at left and Infinity at right. About a mile from us. Infinity is a 290' megayacht which is not available for charter, which means her presence here is at the behest of her owners. She sleeps up to 14 guests and carries a crew of 27. Intrepid is her support vessel, complete with large helipad (Infinity herself has a much smaller helipad). The chopper was away when we dropped the hook, but it's here now and so we imagine the owner or his guests arrived thereon this afternoon. The two vessels are anchored some distance apart, but a large tender with likely 1,200hp or more of outboards make it a short ride between them. Tomorrow morning we will weigh anchor for the 5-hour run to Big Majors Spot, north of Staniel Cay. We have friends who are there now, so we're looking forward to sundowners with them. And the electric element for the grill, which is sitting in a hangar in Fort Lauderdale, will arrive at Staniel early this week. Gratuitous shot of our anchorage at Cabbage Cay in the Berries. A yacht with a support vessel.... Is that common? That's a whole different level of wealth. I wonder what the annual operational costs of that setup run the owner.